A cross-channel ferry firm that had been involved in a wrangle with French authorities over unpaid taxes and fees has gone into administration. SpeedFerries, which operated the vessel SpeedOne between Dover and Boulogne, made the announcement on Thursday. Cross-channel sailings on 14, 15 and 16 November have been cancelled. Customers have been urged to keep their tickets. Boulogne Chamber of Commerce seized the firm's SpeedOne vessel over unpaid taxes and fees on 6 November. The action led to the suspension of the SpeedFerries Dover to Boulogne route. Angela Swarbrick and Tom Burton of Ernst & Young LLP have been appointed as joint administrators of the company. They said their aim was to sell the business as a going concern. In a statement on its website SpeedFerries said it had gone into administration to best serve its creditors and customers. It continued: "Crossings have been cancelled for 14, 15 and 16 November 2008 and customers are asked to wait for further information on future crossings and to keep any pre-booked tickets. "We will continue to keep you updated with developments in respect of the long term plans for SpeedFerries and notify you as soon as possible via the company website if changes are proposed to be made which will affect your current position." 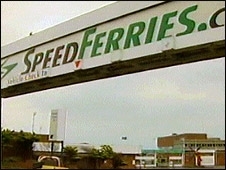 SpeedFerries was set up in 2004 as a low-cost operator and has one route between Dover and the French port.